Kim Stanley Robinson won plenty of awards for his Mars series, Red Mars, Green Mars and Blue Mars. So it is a little suspicious that he calls his new book Red Moon, as if perhaps trying to recall some glory days. But he has his reasons. 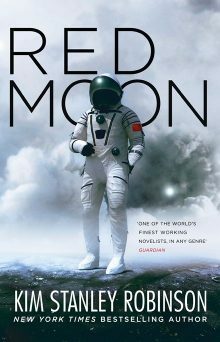 This book, much like his alternate history The Years of Rice and Salt, focusses mainly on China and the Chinese settlement on the Moon. This is also a very different beast to his Mars books. A sequel to his recent Antarctica, it takes forward some of the philosophy and themes from other recent books including the generation ship saga Aurora. It is 2047 and quantum engineer Fred Fredricks has been sent to the Moon by his company to hand over a quantum entangled radio. This device allows for instant, completely encrypted communication between two people. On the way he meets ageing Chinese poet and medias tar Ta Shu, one of the recurring characters from Antarctica (as he keeps reminding readers). Not long after arriving on the Moon Fredricks is implicated in the murder of his client, almost killed himself and kidnapped. It turns out he is in the middle of an internal Chinese power struggle. He is rescued and packed off back to Earth with another troublemaker Qi, pregnant daughter of a high ranking Party Member. But when they arrive back on Earth the two find they are still targets and go on the run with the help of Qi’s connections. The rest of the book, literally all of it, are Fred and Qi running, stopping for a bit, being found, running again, stopping for a bit, being found and running again. This constant movement is what Robinson uses for plot but it quickly becomes repetitive and a little senseless. And while the reader spends plenty of time with Qi and Fredricks, Robinson gives no reason to really care about them or their plight. Like the other point of view characters, they are there to move the plot along (such as it is) or have philosophical or political discussions. The character of Ta Shu does not fair much better, also yo-yo-ing back and forth between Earth and Moon as he tries to help the hapless pair. Robinson is a renowned futurist with some very firm ideas, some of which he has explored before, all the way back to the Mars series in some cases – the use of crypto currencies, the idea of blockchain or distributed government, the potential for artificial intelligence to achieve some form of enlightened sentience, the power of individuals to work en masse to the drive political change. Red Moon is yet another vehicle in which he rehearses these ideas through the dialogue of his characters or (in the case of the AI character) their internal musings. While there are interesting ideas here, none of this is particularly new or presented in an engaging way. Red Moon is just a slog in which movement is used as a proxy for action and characters are vehicles either for a naïve or ignorant audience (Fred) or for espousing particular political and social points of view (Qi). For those keen to visit the Moon science-fiction style there are better ways from classic Arthur C Clark and Robert Heinlein through, more recently, to the Luna series by Ian McDonald.